The above products for Studio are exactly the same as the products available at proDAD or its dealers excepting the fact that no other plug-ins are included for other NLEs and also no Standalone version. These licenses only allow the use within Pinnacle Studio. If needed the license available at proDAD or dealers needs to be sold separately. Heroglyph RAPID is generally NOT available for Pinnacle Studio. This alert occurs mainly in "Heroglyph for Pinnacle Studio" and is frequently mis-understood. This occurs mainly in "Heroglyph for Pinnacle Studio" and is almost misunderstood. Heroglyph for Pinnacle Studio can only be used as a plug-in for Pinnacle Studio. If now the standalone version is in use it is just not licensed. The Heroglyph plug-in can only be used with Pinnacle Studio. After installation of the licensed version, the Studio plug-in of Heroglyph is accessed from the "Video Effects" panel in Studio. The plug-in is fully integrated into Studio and allows the use of Heroglyph directly from within the Studio program. If you wish to run Heroglyph as a stand-alone program or as a plug-in in other programs, you will need to buy a separate license at proDAD or from an authorized dealer. Please download the proper Service Pack [Link #1] for your Heroglyph Version. Double-click the file to execute the installation. Before you start the installation, please close any Heroglyph using programs (for example NLEs) or Heroglyph. Please select the Heroglyph Service Pack using right mouse and "save target as ...". After download, copy this file to your target machine/system and execute it as described above. 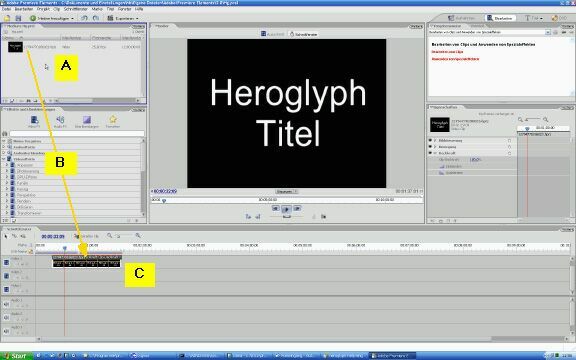 How to create a Heroglyph-Title in Premiere Elements or Pro. The most popular and comfortable use of Heroglyph is as plugin in Premiere Elements or Pro. 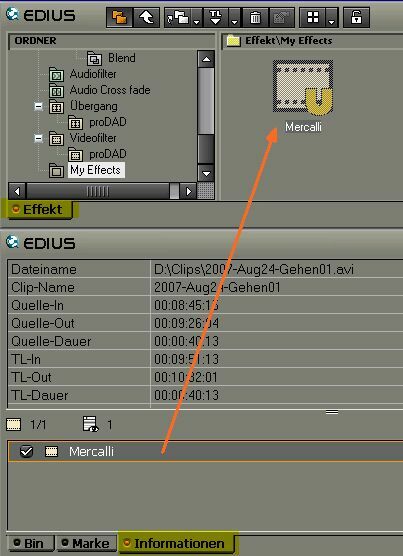 Just create a title and place it in the Premiere Timeline - in the same way as known from the Premiere-own titler. Don´t worry about the graphic format, Import and Export processes or eve Alphachannel! The plugin solves this automatically for you! Heroglyph will start up for the title editing. Once you created everything, press F12 to apply the title and to go back to premiere. Drag the title-scene into the premiere timeline [B]. Double-click the title-scene [Premiere Timeline] [C] and "edit Title Image 3. If you wish to edit the title-duration in the premiere timeline directly, deactivate "use Heroglyph timebase". Make sure that the option"Composite" is switched on to see the title over the video with matte. The Heroglyph "Service Pack" is unable to install due to a version conflict. A full version or demo version of Heroglyph 2.5 is required for this Service Pack. Please choose the right Service pack for your heroglyph version.